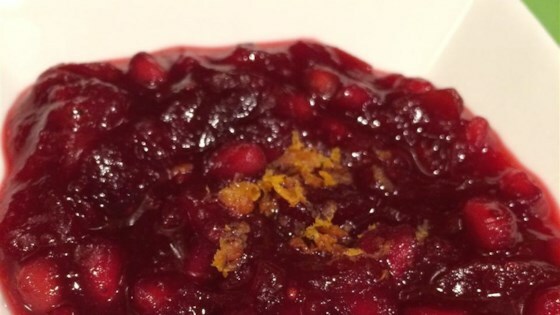 "Don't settle for boring, mediocre cranberry sauce this holiday season. Instead, serve your friends and family this amazing reboot of the traditional Thanksgiving relish. It goes great with holiday fare like turkey and everyday favorites like biscuits. Or you can even serve it with vanilla ice cream as a dessert! Jar or freeze your leftovers to enjoy this sauce year-round!" Combine cranberries, sugar, orange juice, water, corn syrup, port wine, lime juice, cinnamon sticks, 1 1/2 teaspoons orange zest, cloves, and 1/4 the pomegranate seeds in a heavy pot; bring to a boil. Reduce heat to low and simmer, stirring occasionally, until cranberries pop and sauce is thickened, about 30 minutes. Taste the sauce and add more sugar, corn syrup, or port wine if desired. Remove cloves or cinnamon if the taste is overpowering at this point and add more port wine or lime juice. Continue to simmer sauce, stirring occasionally, until desired consistency is reached, 15 to 30 minutes. Remove pot from heat and cool, about 30 minutes. Sauce will thicken as it cools. Remove cinnamon sticks and cloves if still in sauce. Stir remaining pomegranate seeds into sauce and garnish with remaining 1 1/2 teaspoons orange zest. A vibrant sauce for your holiday table. This sauce actually tastes better the next day, so prepare it the night before and refrigerate until ready to serve. Prepare your sauce in an enameled cast iron Dutch oven or casserole pan. Cast iron distributes heat more evenly than aluminum or stainless steel, and the enamel prevents sticking and burning, reducing the risk for sauce-making disasters. Commercial orange juice with extra pulp can be used instead of freshly squeezed.